The MOW Celebrate Chinese New Year event last Sunday was a great success, thanks to our generous Donors and Volunteers, and last but not least to Cafe Kaseh for their sponsorship of the delicious lunch. Below are the list of Donors. Stay tuned to our blog for the Chinese New Year Event day write-up which will be posted before Chinese New Year. It was MOW Food Bank's first delivery for the year 2013, and it was done by seven MOW team members and volunteers on Sunday, 20th January 2013. We congregated at our Penchala centre at 11am and by the time we completed the deliveries, it was almost 3pm. We were exhausted and hungry but in high spirits ... our efforts in that 4 hours meant that these families will at least have nutritious food on the table for 2-3 weeks. The mothers and their children came out in full force to greet us ... the "older" families hugged and kissed us, while the newer families were a little shy at first and remained in the background. But one thing for sure is, they were all happy to receive us! Even the children "salam" with us. 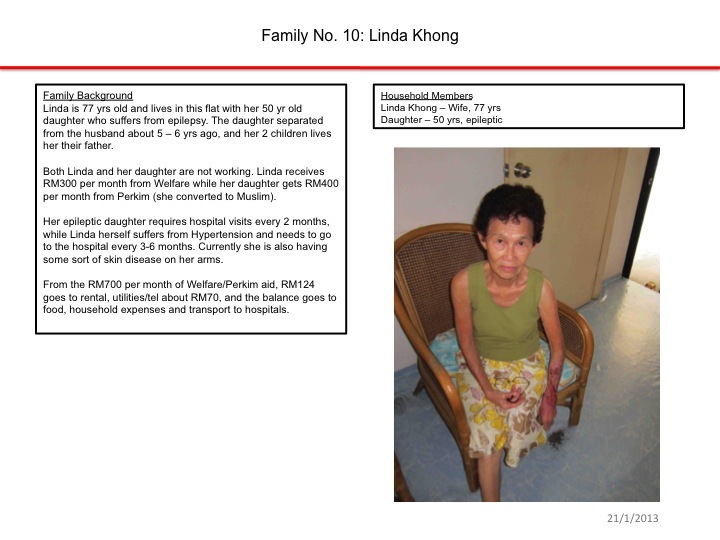 The mothers received groceries worth about RM100 each, and the children received angpows from Brother Ivan. Catherine interviewed the families, about their background and circumstances, as well as their views on the groceries we are providing, and other assistance needed. Chloe, who is an orphan, showed us a picture of her beloved parents while her brother Lucas' attention was 100% on the new toy he just received from us. They live with their grandmother, and their aunt visits regularly. 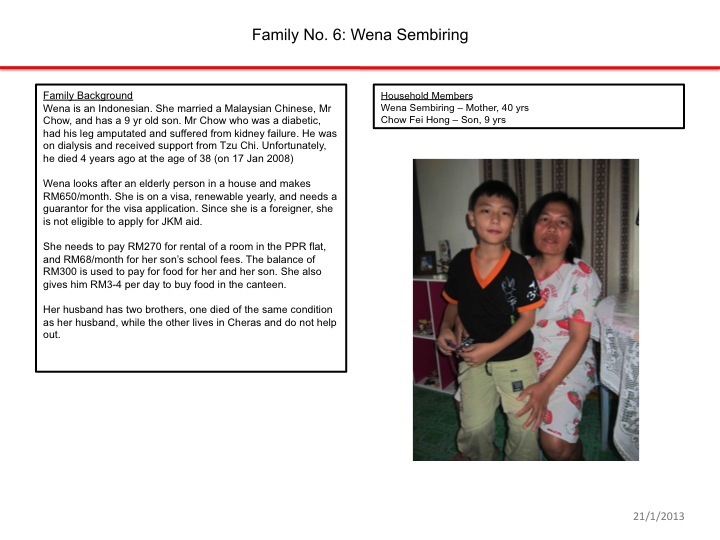 Wena and her son Fei Hoong came down to the carpark and collected their groceries. Then we moved on to PPR Desa Rejang in Setapak, where 6 families were eagerly waiting for us at the gazebo, our usual meeting and delivery point. 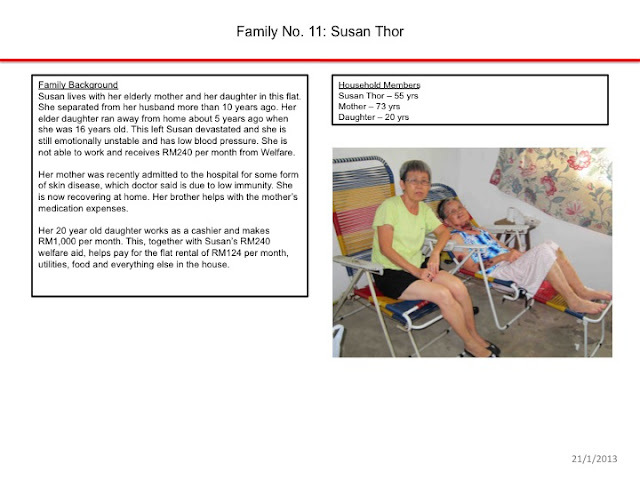 Susan came alone as her elderly mother is too frail to walk. 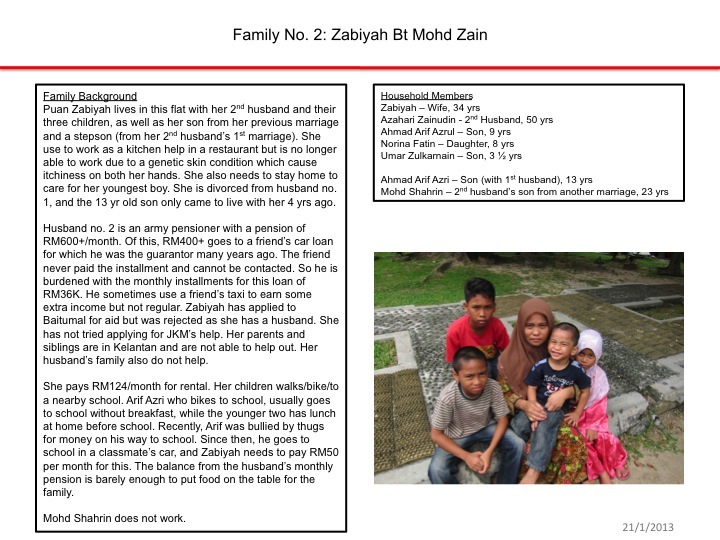 Rozana came with both her girls, but her OKU girl refused to be photographed. Nurjalila actually lives in Wangsa Maju but made the trip to Desa Rejang to collect the groceries. 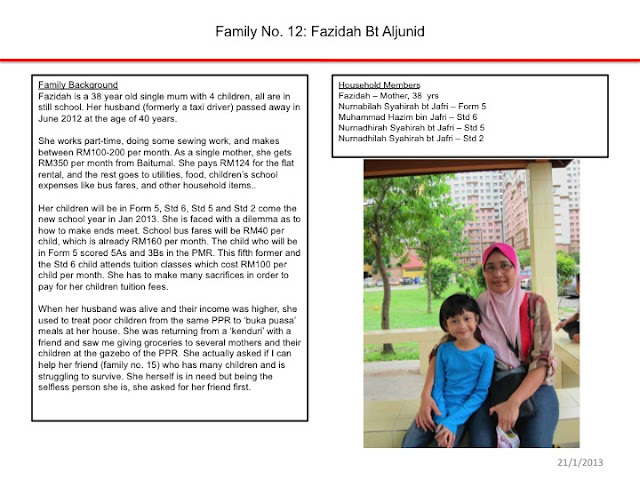 Two other families could not make it, and their groceries were left with Aida who delivered to their flats later. Next stop was PPR Taman Melati in Gombak where Fazilah, Zabiyah and Padmini, and their children live. ... and so was Bro Ivan! 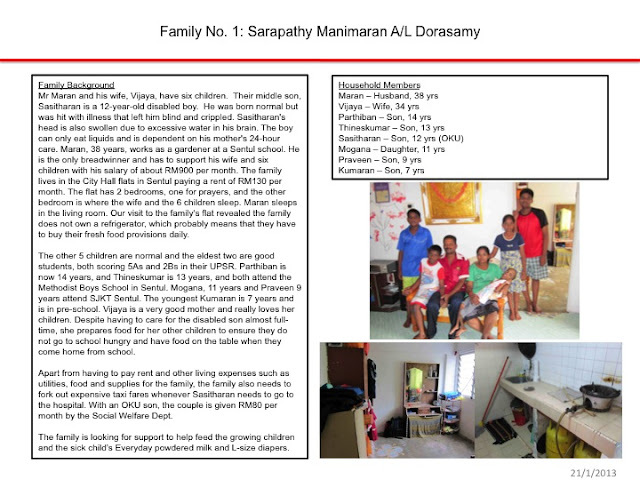 The Maran family in Sentul was not at home on that Sunday, and their groceries was delivered by Kim on Wed, 23rd Jan. Vijaya was at home with her paraplegic son, Sasi, as her husband was at work and the other children in school. We actually woke Vijaya when we arrived at her doorstep at 8:30am bearing the boxes of groceries. She was coughing and not feeling well, but still gamed enough to oblige us with a picture. A BIG THANK YOU to our generous donors to the MOW Food Bank program, without whom the program would not have been possible. 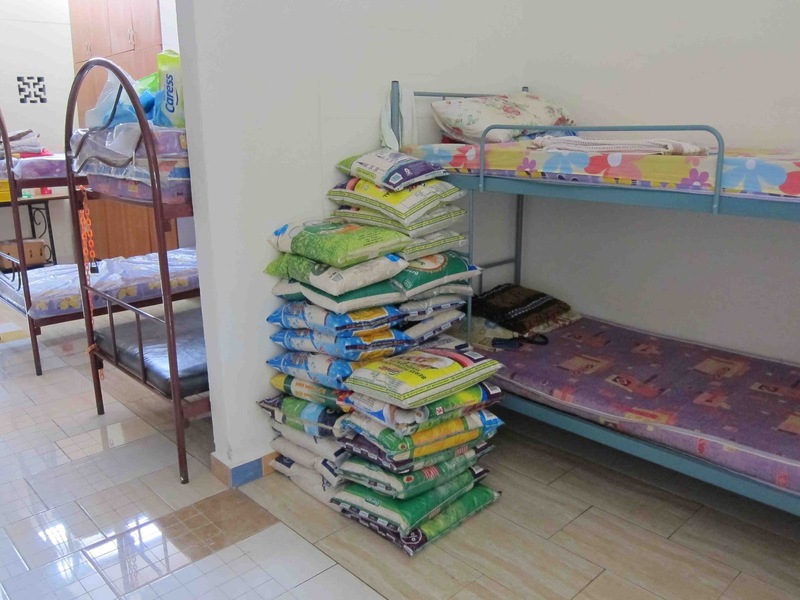 Some of the families have sponsorship for several months of this year only. If you wish to sponsor one or more of these families for the rest of the year, please email us at trccpenchala@gmail.com, and let us know which family(s) you would like to sponsor and for how many months. 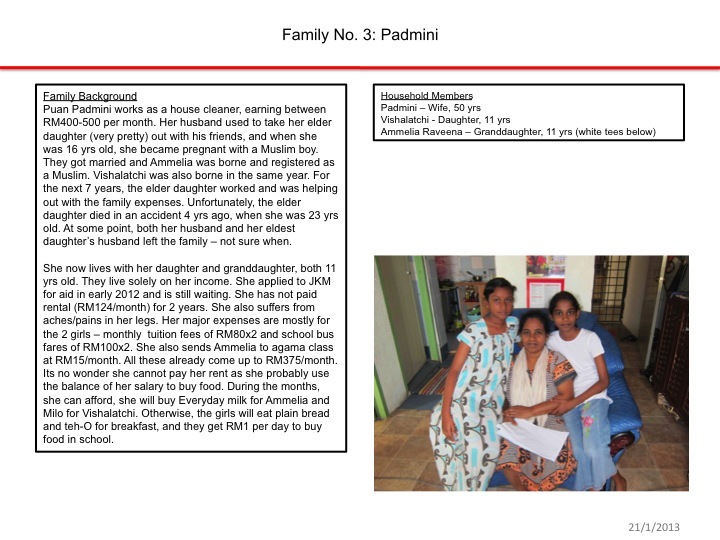 On behalf of these families, we thank you for your support and care for their livelihood. 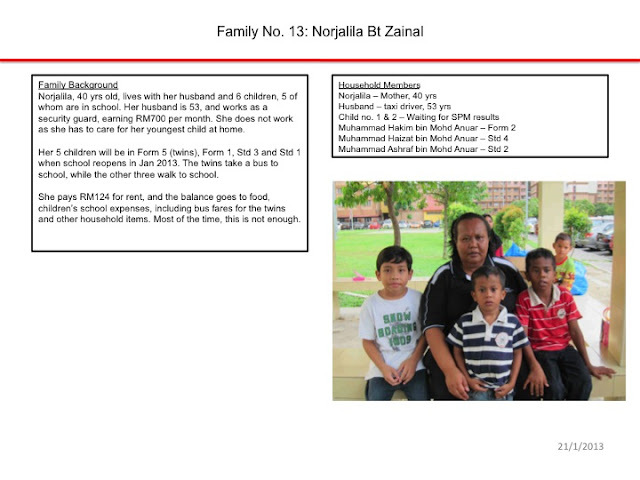 MOW Food Bank program commenced in Sep 2012 with 4 families. 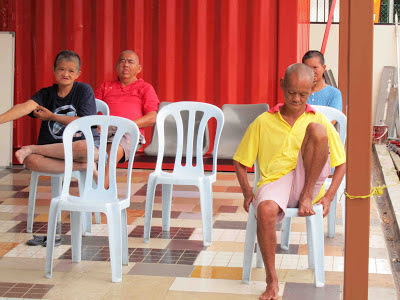 The program helps people who are not able to cope with the high cost of living in Klang Valley, by providing nourishment to their families, especially those with school-going children and elderly folks. From January 2013, MOW Food Bank will provide monthly groceries to 13 poor families, all of whom have been screened for eligibility by the MOW committee. 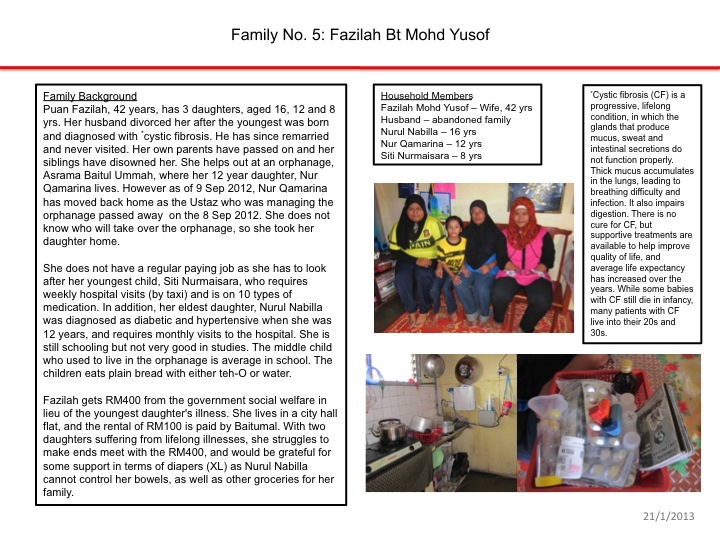 The groceries which include rice, flour, sugar, mee hoon, biscuits, etc, cost about RM100 per family per month. Of the 13 families, Families No. 5, 10, 11, 12 and 13 are currently sponsored by individual sponsors, while the cost for groceries for the other 8 families are paid for from TRCC general fund. A brief profile of each of the 13 families are given below. If you would like to lend a helping hand and support one or more of these families in the MOW Food Bank program, please email us at trccpenchala@gmail.com, and let us know which family you would like to sponsor and for how many months. Thank you for your generosity and kindness. With your support, these families will have food on their table and their children have a chance to make something of their lives. Imagine being old, physically handicapped or mentally challenged, having no close family to turn to, at times feeling overwhelmingly lonely and spending day after day sitting around with nothing much to do and staring into nothingness. 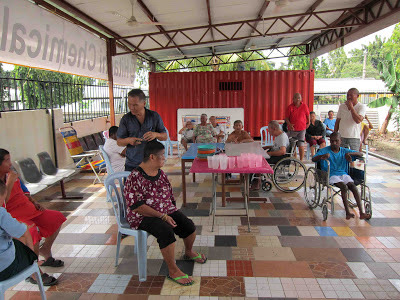 This was my take of the 25 residents at Rumah Amal Murni when Bro Tommy, Bro Ivan and myself visited the home, late morning on Thursday, 3 Jan 2013. 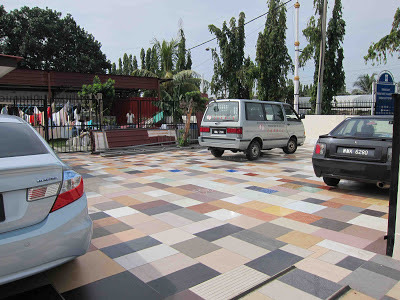 Rumah Amal Murni was established in 2005 to care for the elderly and underprivileged and managed by a committee of Persatuan Rumah Amal Murni Kajang. The home currently houses 25 residents, 11 females and 14 males, aged between 15 years to 79 years. 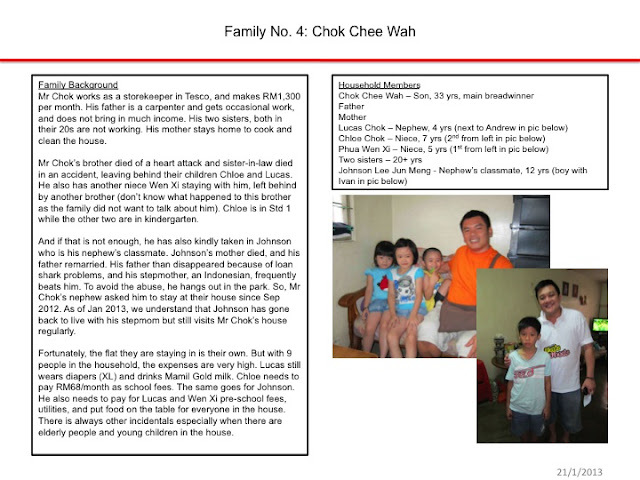 Majority are Chinese, although the home does have 3 Indians and 1 Malay resident. The 15 year old girl and another 2 residents in their 20s and 30s have down syndrome. Several residents in their 40s are either physically or mentally handicapped. The home relies solely on public funding. Monthly expenses can run up to RM10,000. 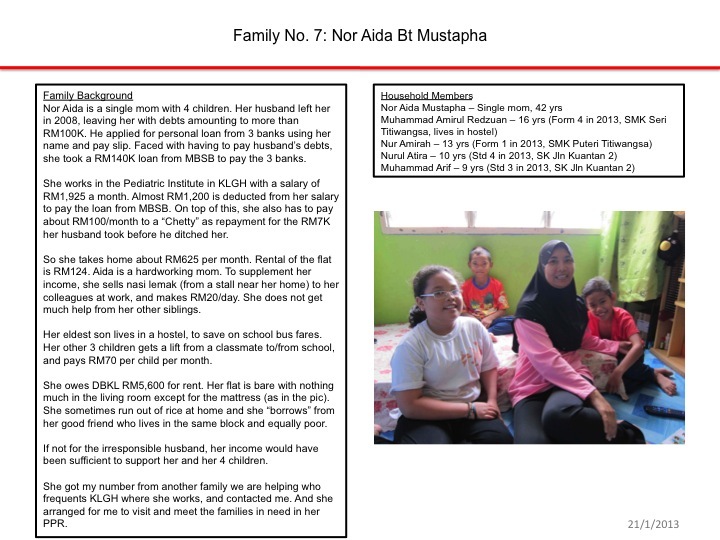 The home only gets paid by 4 to 5 residents’ sponsors (usually some association or NGO and not family members), and the total amount is about RM1,200 – RM1,500 per month. Apart from rice, their other food supplies appear to be depleting. 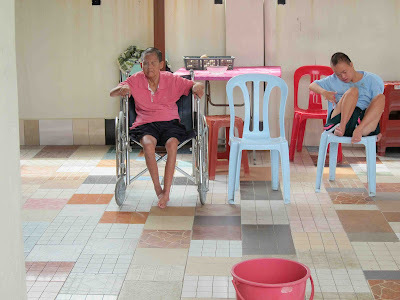 The home is run by Mr Soo, the administrator, who has been there for 4 years, supported by a cook, a maid and one of the resident in his 60s who help bathe and care for some of his fellow residents. Mr Soo manages the home well as it looks clean and tidy, and the residents, although most looked bored, appear to be well taken care of physically. Unlike children in orphanages who goes to school for half the day and has homework or revision to attend to after school, the old folks and handicapped do not have much activities to occupy themselves. For their own safety, they live behind this fence with a locked gate. 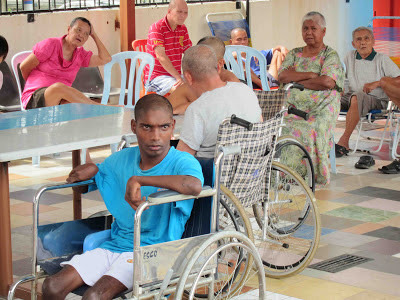 When the TV is turned on, some of the mentally handicapped residents just stare at the TV without any comprehension of what is going on. Sadly, they just sit around in the big dining hall and wait for meal times. A day in the home passes by very, very slowly. To show we care, MoW would like to do something special for the residents. 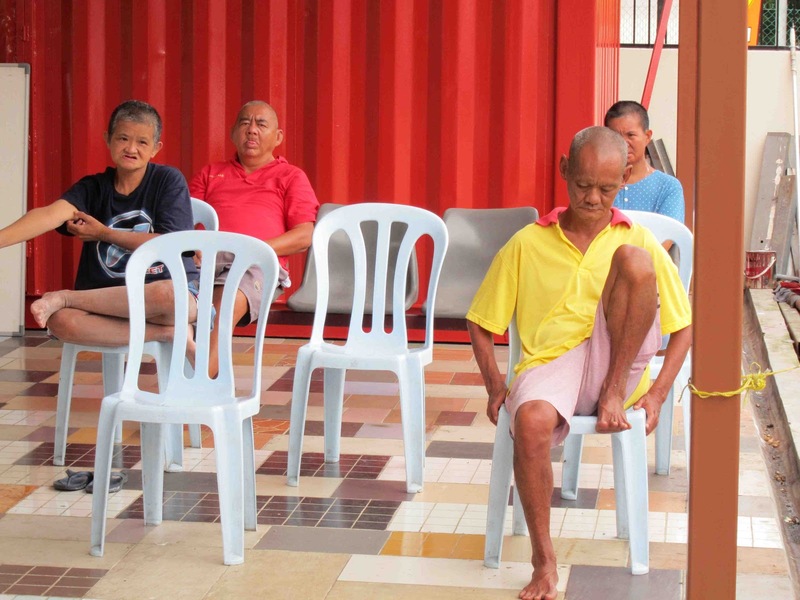 Do come celebrate Chinese New Year with the residents in Rumah Amal Murni … show them that someone out there cares, and bring some joy and laughter into their mundane lives. Below are the items requested by the home. 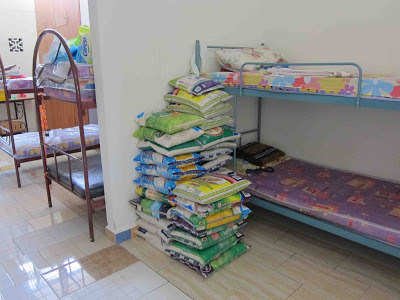 We have not specified the quantity for some of the items, so we will just bring whatever that is contributed by donors. For all items, you may sponsor the actual items in whatever quantities or donate cash (any amount) by banking into our account (Acc Name: Ti Ratana Community Centre Penchala CIMB Acc No: 14660000259057). 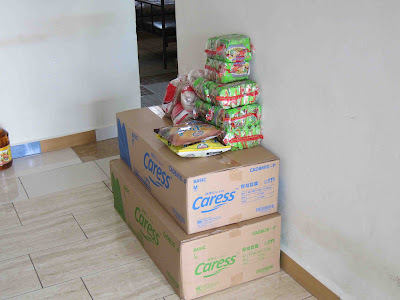 Since it is a Chinese New Year celebration, you are also welcome to donate cookies and other festive food items (except mandarin oranges which the home feels is not suitable for the residents). All items must be delivered to Ti-Ratana Penchala Centre by 5pm, Wednesday, 30th January 2013, to give the committee sufficient time to buy any outstanding items and pack the items. 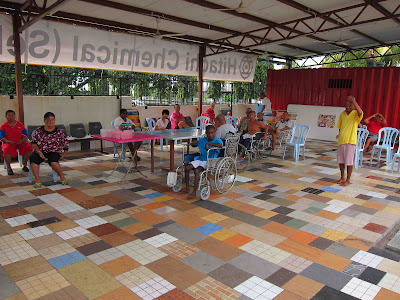 Apart from these, we are also seeking individuals or group of individuals who have experience in organizing entertainment/activities for the elderly and the physically and mentally handicapped. If you would like to contribute to this event or need more details, please call June at 03-77849002 or email trccpenchala@gmail.com. For logistic and security reasons, all volunteers who wish to participate in this event are requested to pre-register your name and contact number with us by emailing trccpenchala@gmail.com. 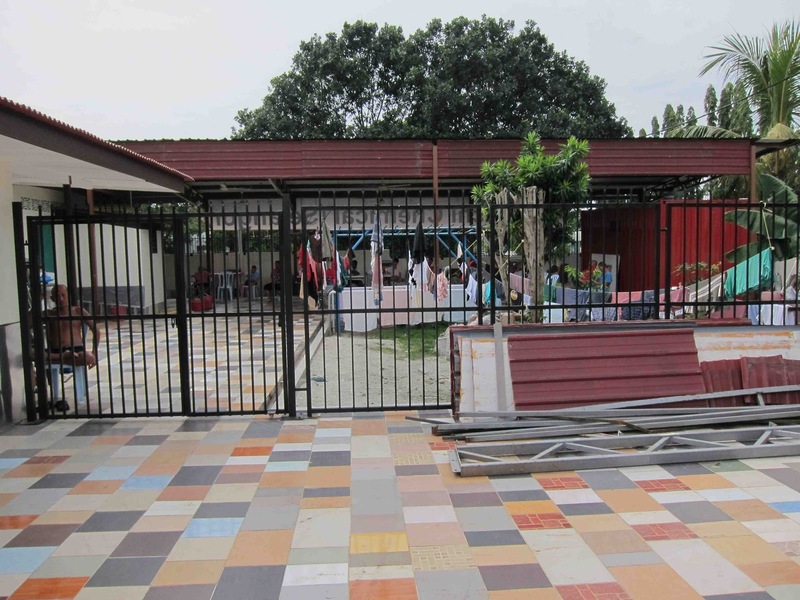 Please arrive at the Ti-Ratana Penchala Centre by 10:30am sharp for a briefing. We shall convoy together to Kajang thereafter. No transportation will be provided, so kindly ensure you make your own arrangements if you wish to carpool with other volunteers to get to the event venue and back to the Centre. Lets come together and join hands to wish the residents at Rumah Amal Murni “Gong Xi Fa Cai”, dance and sing with them, tell them a funny story, light some firecrackers, or anything you can think of to inject some zest into their lives!! !